In collaboration with Sabots Libres, The Equine Independent is carrying out a survey into equine welfare. Please take a few minutes of your time to take part in this survey – the results will be posted here at the beginning of the summer. In a public ordnance dated 5 June 2014, published in “Het Staatsblad van het Koninkrijk de Nederlanden” issue 210, year 2014, is a clearly defined ban on the keeping of horse in stables or boxes. 1. An animal’s freedom of movement may not be restricted in such a way that the animal experiences unnecessary suffering or injury. 2. An animal must be provided with adequate space for its physiological and ethological requirements. 1. A building where animals are kept, must provide adequate light and darkness to fulfil the ethological and physiological requirements of the animal. In order to fulfil its ethological and physiological requirements, a horse cannot be kept in a box or stable. Lighting and darkness in stables and boxes and the space they offer is inadequate for the requirements of the horse. Sadly. the law, and the interpretation thereof, are two different things. It is unlikely that the animal police will take any action where the majority of horses are stabled, even where the boxes are too small. We live in a world of almost endless possibilities. The internet has given us access to information in a way that only twenty years ago was impossible. Vast libraries of books have found their way onto the electronic highway and although not always absolute in its accuracy, Wikipedia is almost as expansive – and accurate – as that highly revered (if fictional) publication, the Hitchhikers Guide to the Galaxy. Add to this the gigantic increase in the popularity of social media in the past 5 years (Facebook, Twitter, Instagram, Pinterest, Tumblr etc.) and the ability to research and exchange information has outgrown our ability to process it all. And suddenly a host of dangers present themselves; we don’t always possess the discipline to pursue a line of thought before publishing it as true – and millions more people believe every word of what they read without question. Case in point is all the hype around Monsanto; without wishing in any way to condone Monsanto, it is notable that people are starting to attribute all manner of disputable products with the company despite Monsanto not having anything to do with them! And similar things are happening in the field of barefoot horses (I use this phrase to avoid associating with any particular trimming method). 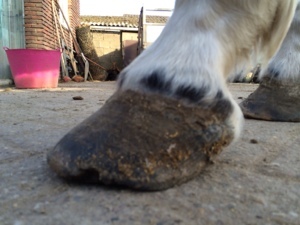 Hundreds of photographs are posted daily in fora and on Facebook of variously trimmed or untrimmed hooves asking for advice or confirmation. And a world of “specialists” is sitting on the sidelines waiting to dispense varying diagnoses, suggestions, warnings and arguments – purely on the basis of a (frequently poorly shot) photograph! Obviously the horse owner has the choice to ignore all this commentary – then again, why did he post the picture in the first place? Usually for confirmation that he is treading the right path, only to be inundated with – often fatuous – remarks about this hoof, a history of hooves and just about any hoof in general… But worst of all are the “…you need to…” comments dishing out advice that most owners would be better off without. Not that all the advice is necessarily bad, but it is often conflicting, frequently confusing and usually conjecture. Trim a bit more here, rasp a bit more there; the heels are too high/low and the frog should be shorter/longer/thinner/thicker… And here is a magic template to solve all your woes. But these people have never seen the hoof in question live. 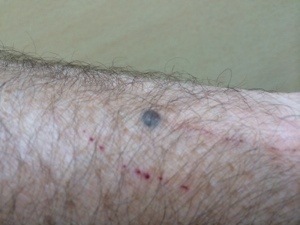 I have a dark raised mark on my arm; if I was to post a picture of it on the internet I would get all manner of reactions declaring it to be a mole, to have been jabbed with a pencil (my mother’s favourite! ), to be a malignant melanoma or an alien implant… In fact, I have no idea what it is other than I have had it for longer than I remember and it never changes – so I leave it alone! Which is what we should do with all these hoof photos on the web… If you’ve been there, touched it, scraped it with a hoof knife and been able to evaluate with your own eyes, ok. Otherwise, try and refrain from speculation and conjecture. I know of at least two people who have ended up crippling their horses, admittedly through their own stupidity, but at the behest of all these internet advisors.